The podcast is an odd beast, we called it “All Things Java” but it’s a misnomer. Actually the design of the podcast is that it’s supposed to be the Virtual Pair Programmers team meeting – ie something we would have to do anyway – and we release it with the minimum of editing. Maybe if we mention any specific financials we might edit that out. Otherwise, it’s warts and all. We don’t pretend to be on top of the latest developments in Java, we don’t pretend to be master business people. So I feel that the podcast might disappoint those wanting a pure Java podcast (I really miss the old “Java Posse” podcast, we certainly couldn’t replicate what they did), but I hope it might be of interest to anyone with an interest in Java (natch), but also business, content creation and the general problems of trying to be successful in software. Maybe we’ll rename it one day, if we can be bothered. 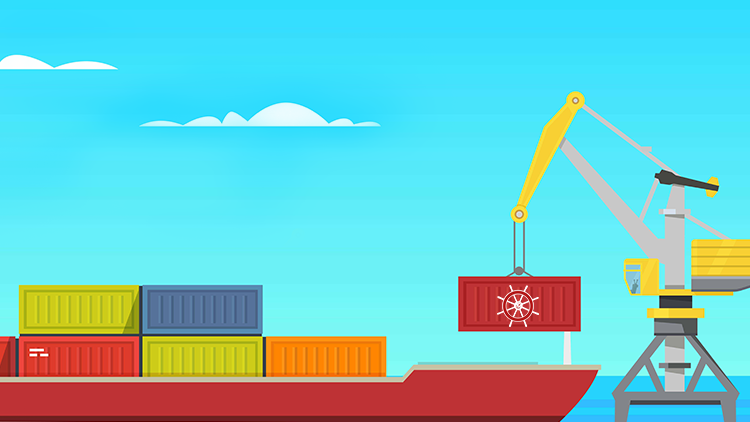 Second course to be published at Udemy: Kubernetes Microservices. I’ve set up a coupon code for a great deal. – although of course I can’t help dropping in a few references to Java along the way. It’s a 12 hour hands on project: scenario – developers have pushed a set of images for a microservice system. Your mission, should you choose to accept it: define a Kubenetes workload locally, then deploy it to the cloud. Build in a level of resilience and then set up a proper ElasticSearch basic logging and monitoring system. At the end of the course you’ll use your monitoring system to discover the developers did a pretty bad job in one of their images! It was fun to record, hope it will be fun to watch and more importantly, a great set of real world skills for you. A version of the course will appear in around a week at virtualpairprogrammers too. I’ve just released my first course on Udemy. It’s a combination of the two modules I’ve previously published at VirtualPairProgrammers. If you’re already a subscriber at VirtualPairProgrammers don’t buy the course again – but if not this course is a great way to get some real hands-on experience of Docker in a production cloud environment. I’ve set up a discount code for Udemy, follow this link for a great deal. Kubernetes next up in a week or so! Leave a comment on Docker Build Hanging? TLDR; create a .dockerignore file to filter out directories which won’t form part of the built image. Long version: working on the upcoming Kubernetes course, with a massive deadline looming over me [available at VirtualPairProgrammers by the end of May, Udemy soon afterwards], the last thing I need is a simple docker image build freezing up, apparently indefinitely! This just a small extract from the process log. This [every file in the repository being visited] is normal behaviour of the docker image build process – I guess I’ve just been working on repositories with a relatively small number of files (Java projects). This being an Angular project, one of the folders is “/node_modules” which contains a masshoohive number of package modules – most of which aren’t actually used by the project but are there as local copies. This directory can be easily regenerated and isn’t considered part of the project’s actual source code. [edit to add, it’s the equivalent of a maven repository in Javaland. The .m2 directory is stored outside your project, so this isn’t a concern there]. 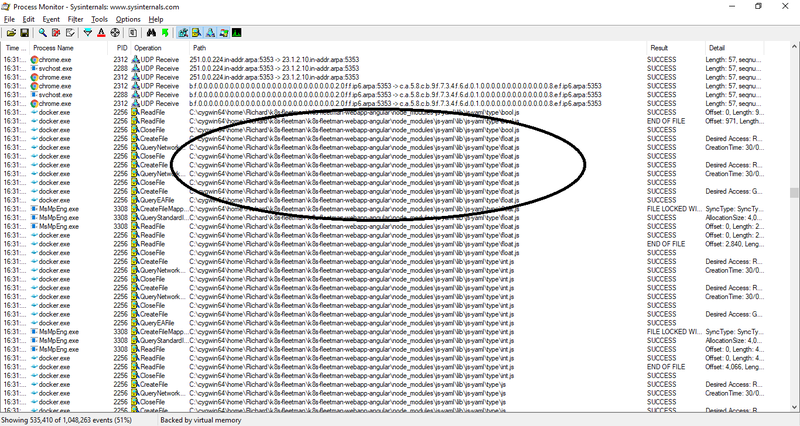 Turns out, the /node-modules folder contained 33,335 files whilst the rest of the project contained just 64 files! Routinely, we .gitingore the /node_modules folder, and of course it makes sense to ignore this directory for the purposes of Docker also. You might also consider adding .git to this ignore list. Leave a comment on Problems with dockerHost in Maven? This happens on Windows Toolbox (ie anything below Windows 10 Pro) and possibly Mac toolbox as well. Of course don’t just copy and paste these values – check they match the output of docker-env. I’m back on the AllThingsJava podcast again. I had a shocking hangover when recording it so forgive my vague rambling. News – (actually old news but since the last podcast) JavaEE is dead, long live JakartaEE. Matt is planning a new course on Kotlin, coming soon. I’m planning a new course on Kubernetes, coming even sooner. I’ll blog about this new course shortly. I should have done Kubernetes a year ago, I feel somewhat left behind and there are other good courses out there – I’m not sure how I can be different so I’m working on an “angle” right now. Hope I come up with something worth having. A new podcast is now available over at AllThingsJava. I’m not on it, which makes it even better than usual. The guest is Jon Humble, an experienced Scala developer. …unlike me, Jon knows what he’s talking about so check out the podcast, lots of Kafka and similar buzzword goodness in there. In a previous post I listed the features added to Java 10. Naturally in a six-month update, the list isn’t long and most of them are updates to the runtime (such as very welcome garbage collector updates or internal changes). But the number 1 headline grabber is the addition of type inference for local variables, and it’s a biggie. Let’s take it for spin. Which, if you think about it, is a bit absurd. We have to tell the compiler twice what type of object we’re creating. There is a reasoning behind this – technically the left hand side is telling the compiler what type we want the reference to be stored as, whilst the right hand side is the concrete object we’re creating. Sometimes, the difference is important and relevant – when programming to interfaces. Here want to instantiate a specific type of customer, but for the rest of the code, we only want to call the methods that are common to all customers. Polymorphism, blah blah blah. We’re not interested in that today, I just wanted to point out there is a reason for the left-hand-side-right-hand-side apparent duplication. Here’s the thing – for the most part the two sides of the equation are duplicated. I want a customer and it needs to be of type customer. Don’t Repeat Yourself is a bad thing and it’s almost like traditional Java wants us to repeat ourselves! “var” is one of those rare things in Java, a brand new keyword! Java will now guess (it’s not hard is it?) that the type we want is Customer. For the rest of the post I’ll describe a more realistic use of var. I’m picking an example from Spark, but don’t worry if you haven’t used Spark before, the example is actually generic. Ouch. No! I now have a compile error…the type on the Left Hand Side is wrong. So now we reach a ludicrous situation: the compiler knows what the type should be, and I don’t. And the compiler won’t let me proceed until I guess correctly. (Ok, what I mean is – until I work out the right type). Often on the Spark course I advise the viewer to simply leave off the return type and then use Quick Fix for the IDE to add in what it thinks is the right type! Using the “Create Local Variable” Quick Fix should add in the left-hand-side declaration automatically. But what a performance! And obviously the compiler knew the right answer all along. It was just teasing us. Much cleaner and I hope in the long run, simpler. Note that none of this destroys strong typing – the type of result is still the same as it was, and we can only call the methods defined in the JavaPairRDD class, exactly as before. If you’re keen to try Java 10 (of course you are!) then you can download the JDK from Oracle at the usual place. 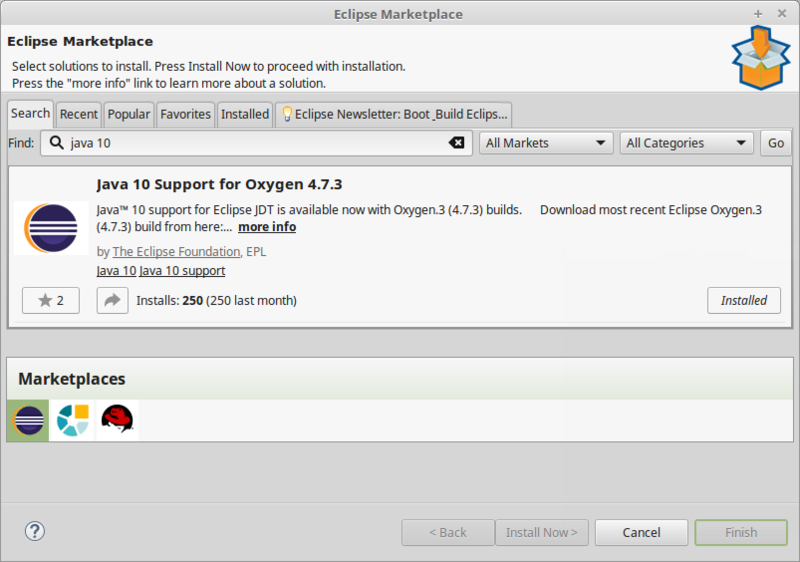 I’m still with Eclipse (for the time being at least), and to use Java 10 (at the time of writing), you need to be on the latest version (currently Oxygen.3 aka 4.7.3) and you need to install (via the Marketplace) a Java 10 plugin. After installing the plugin, restart Eclipse and then define a JDK (using the usual tortuous Window -> Preferences -> Java -> Installed JREs and navigate to the folder you downloaded the JDK to).If you haven’t installed the plugin, this will fail because eclipse won’t recognise the new structure and layout of the JDK. 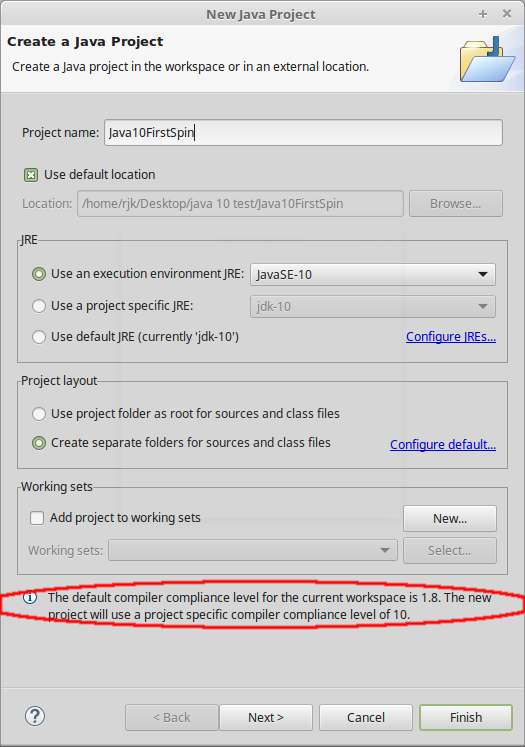 New Project Window – looks like the compliance level is going to be set properly! And that’s it. You can now create a class and start using the new features – the next blog post will explore what I think is the best of them, Local Variable Type Inference. 2 Comments on Java 10 is here…already! Wow – that was quick. After years of interminable delays to Java 9, all of a sudden the new strict release cycle has kicked in and the first result of that, Java 10 was released on March 20 2018. Obviously many projects/organizations will insist on only using the LTS releases, so the reality for many Java developers is that adopting Java 11 will probably be long term stretch goal. (By my reckoning, if they keep their promise, Java 17 will be the next LTS after that – it will interesting psychological challenge for the likes of banks to upgrade from 11 to 17 in one jump!). For anyone not tied to LTS releases, we’re going to get a new set of toys to play with every six months! Here’s the full set of JEPs (JDK Enhancement Proposals) you can use right now in Java 10. Most of them are under the hood enhancements, cleanups and non-coding related changes. But the headline for Java programmers is the first of them, JEP286 – which I’ll write about in my next blog post. It’s a stunning improvement to Java.